• Young Forests are simple ecosystems with even aged trees of mainly one species and limited undergrowth. Usually coniferous, these forests occur on most types of terrain and at various elevations. Most young forests are regenerating from clear-cut logging practices; some are planted trees being managed for future harvest. As young forests develop, biodiversity can begin to recover if species variety has been retained, either as seeds within the soil or in nearby mature forests. • Mature Forests contain mainly coniferous trees, generally more than 60 years of age. In the Discovery Islands mature forests on productive sites develop old forest characteristics by about 140 years. Some forests that appear mature may actually be old forests growing on poor sites, where trees never grow very large. 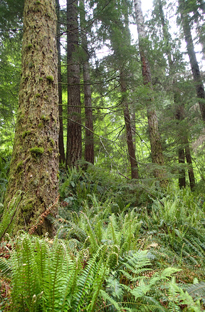 Most mature forests are second-generation forests resulting from logging, but some are the consequence of other disturbance, including fire, wind, or disease. Forests will increase in biological diversity and structural complexity if the original species are retained in nearby old forest-refugia. As these species are able to disperse, mature forests develop increasingly complex inter-connected relationships. Young and mature forests are not mapped in the DIEM project. They are not classed as sensitive ecosystems. 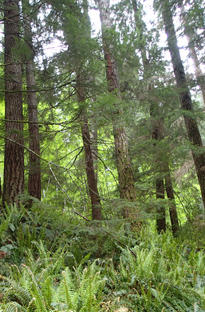 Young and mature forests are common in the Discovery Islands. These stages of forest regeneration do serve as primary connections in a fragmented landscape: they provide important ecological resilience and can be future old forest for the islands. Young and mature forests are typically conifer-dominated stands that grow at almost every terrain and elevation. They may be the second or third generation on a given site and they usually result from human disturbance. Forest managed for rotational harvest is increasingly common. Young forests have closely spaced and similar size trees that create a closed canopy and understorey that supports only a few shade tolerant shrubs. At around 50 years, forests begin to recover biodiversity when light can penetrate their dense canopy branches. In order for the forest floor to develop rich diversity, returning species must have been retained as seeds within the soil for decades or must migrate from an adjacent older forest. Mature forest ecosystems are characterized by mixed tree sizes and increasing diversity, however they usually lack large snags and large woody debris. 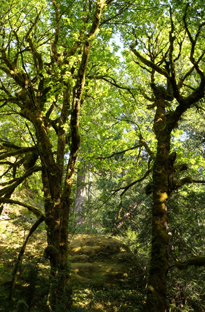 In mature forests, the canopy is somewhat open and the humid understorey is becoming well-developed with a variety of ferns and mosses, saplings, and plants that provide favourable habitats for numerous animals and plants. Where they border sensitive ecosystems, mature forests are protective buffers that increase landscape connectivity and species movement. As they become more complex, young and mature forests gain and support an exceptional range of lichens, fungi, canopy insects, and soil invertebrates. Young and mature forests are essential as stages of development, and necessary for the continued existence of Old Forest ecosystems. WHEN YOU EXPLORE forest ecosystems, enjoy the berries, but make sure you know which ones are safe to eat! Edible berries include salmonberry, blackberry, thimbleberry, salal, and Oregon grape. Note:Species diversity increases as forests mature and when more light penetrates the canopy. Second-growth forests over 50-60 years that have grown near intact older forest refugia may acquire many old forest species as these species are able to disperse or develop; conversely, forest biodiversity will diminish where suitable old forest refugia are absent. FAUNA Barred owl, black-tailed deer, black-throated gray warbler, chestnut-backed chickadee, downy woodpecker, red-breasted nuthatch, red-breasted sapsucker, red crossbill, red squirrel, satyr anglewing butterfly, short-tailed weasel, warbling vireo, western tiger swallowtail, banana slug, banned-tailed pigeon, barred owl, big brown bat, black bear, brown creeper, common raven, hoary bat, little brown bat, northern flying squirrel, Pacific sideband snail, gray wolf, cougar, black-tailed deer, great-horned owl, northern flicker, Pacific slope flycatcher, Pacific wren, pileated woodpecker, pine white butterfly, red-breasted nuthatch, red-legged frog, Roosevelt elk, silver-haried bat, Steller’s jay, wandering salamander, western tanager. 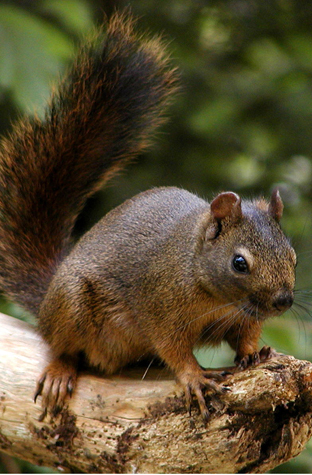 They live year-round in mature forests near swamps and streams. 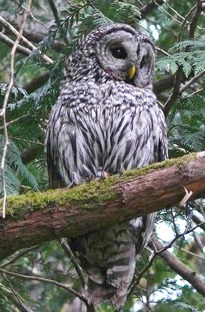 Their call sounds like “Who cooks for you?” Young barred owls can climb trees by grasping the bark with their bill and talons, flap their wings, and walk up the trunk. An attractive evergreen shrub of coniferous forests, salal can make the forest understory an impenetrable ticket that also offers cover to many wildlife species. 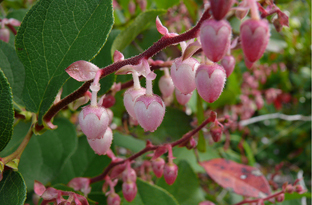 Salal has lovely white to pink flowers that become blue to black edible berries. Indigenous people have long used salal as a significant food source, eaten fresh or dried into cakes. 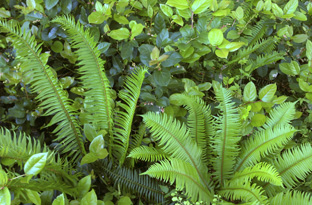 A large evergreen fern of relatively moist coniferous forests is abundant from about latitude of the Discovery Islands south. Each leaflet, where it attaches to the leaf-blade, has a small lobe like a sword-hilt. 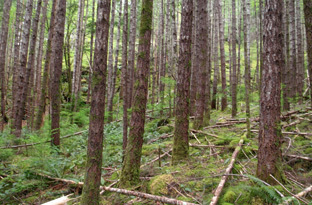 Young and mature forest ecosystems are abundant in the Discovery Islands, particularly coniferous young forests. The young trees may be the second or third generation on a given site. Mature second-growth forest is also common. Forested roads and trails provide many opportunities for viewing and exploring these ecosystems. Familiar Locations: Sonora Island: Thurston Bay Park, Cortes Island: The Children’s Forest, Quadra Island: Morte Lake forest, Read Island: Lot 309 Community Fish & Forest Reserve, South Rendezvous Island: Park, Sonora Island: Yellow cedar forest. Provides branches for a host of other plants, from mosses and lichens to actual young trees. The large hanging flower-clusters, huge leaf up to 30 cm across and the paired winged seeds are distinctive.